One of the okukinu 4 hot springs (a Haccyounoyu, a Kaniyu, a Nikkozawa, and Teshirozawa), the hidden hot spring which walks along an okukinu promenade for about 60 minutes, and goes to along Kinugawa from a Meotobuchi.The course along a mountain stream with little ups and downs which walk in natural forests, such as a katsura, a horse chestnut, a fir, is an ideal trekking course to walk along on a spring-comfortable-weather day.The waterfall which flows through the middle "Kattate waterfall" and a branch and from which it falls can be enjoyed.It seems that river bottom was dug by the discovery at the time of the Edo period, and the typhoon in the second half of a meiji, and the hot spring which carries out a flow out naturally from the rent of the rock near the waterfall exposed the hot spring.Hot-water-quantity Toyotomi and four open-air baths besides an indoor hot spring are enough hot springs. 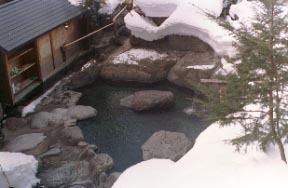 Okukinu Spa: One of the Tochigi 4 backsIt is called Onsenkyo and okukinu 4 hot spring which wells up at the foot of 2038 m of "Kinu-numa swamps" called Japanese highest place marsh, and is dotted with four personality enough isolated lodges. In the circumference of an inn, the absolutely none mountain range of an artificial plantation continues. Four open-air baths are enoughs. 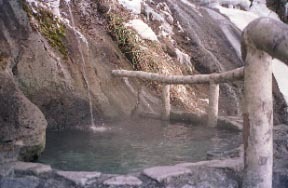 It is an enough open-air bath to the in-no-time side of a waterfall. Simple sulfur spring 52 ° Feather-like mineral-rich sediment. It bruise [ neuralgia, muscular pain, the arthralgia, a frozen shoulder, and ] - Breaks, and they are - chronicity digestive disease, hemorrhoids, oversensitivity to cold, a chronic skin disease, diabetes, high blood pressure, and arteriosclerosis. Kinugawa Spa and Urawa IC-> northeast way, about 100 km-> Utsunomiya I.C-> sunlight and Utsunomiya toll road, about 20 KM-> Imaichi I.C-> Kinugawa road, and -> Meotobuchi hot spring -> on foot 60 minutes or via Kawamata Spa, pick-up use (reservation required).